ROBBIE Williams was granted the Freedom of Stoke-on-Trent yesterday (01.07.14). The 'Angels' hitmaker - who is currently on the UK leg of his 'Swings Both Ways' tour - was incredibly "proud" to receive the honour in a secret ceremony attended by his parents, pregnant wife Ayda Field, their daughter Teddy, 21 months, and Stoke-on-Trent Lord Mayor Majid Khan and paid a heartfelt tribute to his home town. "It's so surreal to feel I've got this huge honour and I haven't totally taken it in. But it's so poignant for me to have my little girl with me and my wife and my unborn baby. "This is Teddy's first visit to Stoke-on-Trent. I grew up here, her life is so different to mine. At her age Stoke-on-Trent was my whole world and I dreamed of getting into another world. "All my dreams came true but as they come true you realise how much you miss the freedom you had as a kid and the safety and security you feel in your own little world. Stoke-on-Trent made me. My humour, my cheeky chappie bit, that's all from here. Cut me and it's through me like a stick of rock." 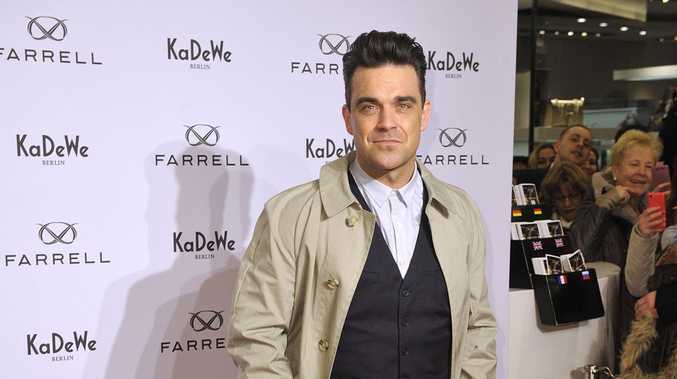 Robbie also tucked into specially-requested bacon and cheese Staffordshire oatcakes and revealed both his young daughter and his American wife are fans of the local delicacy. He said: "Ayda loves oatcakes. My mum brings them over to LA every times she comes so we usually have a stock in the freezer. You can't beat them. Teddy loves them too. Her second word was 'duck' which makes her a true Stokie."